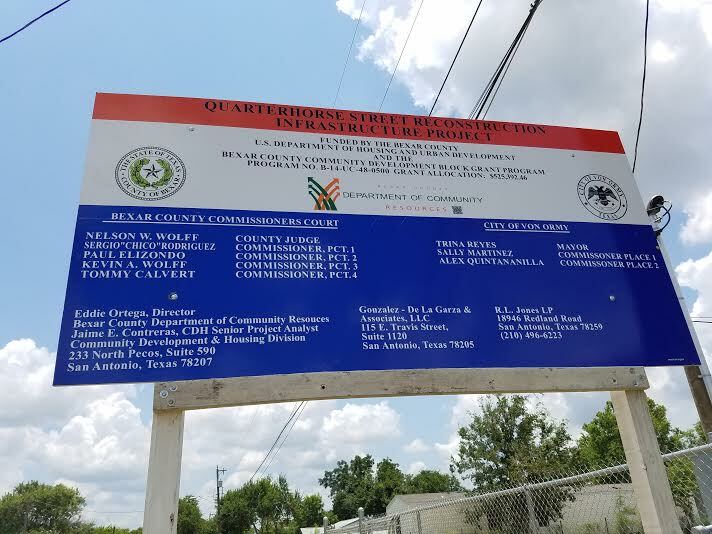 VON ORMY--Bexar County has awarded the City of Von Ormy a Community Development Block Grant (CDBG) to complete its reconstruction and drainage project on Quarterhorse Road. The grant is in the amount of $250,000.00 for Phase III of the project. Construction of Phase II of the project is ongoing. Under Phase II, drainage ditches were enhanced and the road surface reconstructed from Von Ormy Road to the end of cul-du-sac. Phase III will extend these from Von Ormy Road to I-35. Quarterhorse reconstruction was planned to handle the increased traffic from the construction of a City Park, City Offices and new Fire Station located at the end of the Quarterhorse Road. The road was originally designed for residential traffic and not for the increased business traffic resulting from the city's uses. City Commissioner Sally Martinez wrote the grant application, which was approved by the City Commission in February. 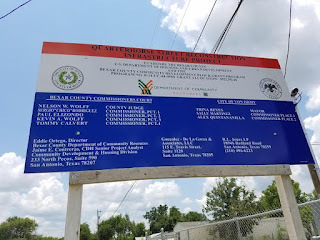 The project was selected among many by Bexar County Commissioner's Court on July 12, 2016 and funded. The engineers on the project are Gonzalez - de la Garza & Associates. Bids for construction are forthcoming. The drainage ditch was a good idea BUT in some areas it made the ditch to steep and full of large rock chunks that its now impossible be cut by the resident anymore. By the time the "City" gets around to cutting it, the weeds are so high and looks awful. Especially if you live across the street in front of the City Council office. If my suggestion could be considered, all the steep ditches starting from Horse Pistol, Horse Back & Tennessee Walker (facing Quarter Horse) be filled with the drainage pipe and covered completely with dirt to be leveled with the main street pavement, it would make it a lot more presentable. If it can't and/or won't be done by the City, can the resident have permission to do it themselves?